Elora Ontario is one of the best-preserved heritage towns in Ontario and is home to the music-lovers' Elora Festival. 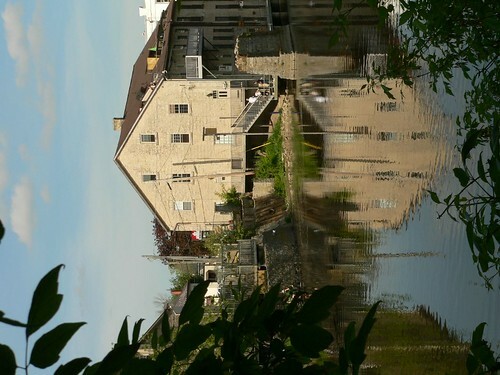 Visit the Elora Gorge & the historic Elora Mill. Elora is one of those places that naturally attracts visitors with an eye for beauty. Its exceptional setting along the Elora Gorge coupled with its well-preserved 19th century stone architecture combine to make it an irresistible subject for painters and photographers. Visit any weekend in good weather, and you’ll find hundreds of people with that creative gleam in their eyes roaming the streets and parks, and plenty more bent over their workshop tables in artists’ studios lining the main streets of the old town. The village is located 115 km southwest of Toronto, which makes it an easy daytrip destination for city-slickers wanting to escape temporarily to small-town Ontario. Its permanent population hovers around 4,000 but you’d guess it was twice that size on a busy summer afternoon. The Elora Gorge Conservation area, with its walking trails, waterfalls and rock gorge has been attracting tourists for more than a century. Back in the 1860s with the opening of the railway, tourists began coming to the area on daytrips to see the magnificent natural formations. It’s popular with hikers, cyclists, campers, canoers, swimmers and inner-tubers. The numerous artists’ workshops and galleries – including pottery, sculpture, glass, jewelry, painting, handmade furniture, quilts, etc. Elora Ontario is well-known as an artists’ haven. The village hosts annual events that bring in even more visitors. These include the Elora Festival (one of Canada’s best-known musical events), the Elora-Fergus Studio Tour, and Art in the Yard (a weekend-long outdoor art show). Between Elora and Fergus Ontario, on Rural Route #1, you’ll also find the fascinating Wellington Country Museum & Archives, set in a former poorhouse -- a rare glimpse of the daily life of the impoverished in the past. The architecture of Elora is memorable, particularly the Elora Mill Inn, the former grist mill. Much of the material used for the stone buildings in the village was quarried from the immediate area and shaped by 19th century stonemasons to last more than a few lifetimes. Don’t spend all your time on Mill Street; wander off and explore the residential side streets too. Elora wasn’t always the “artsy” and touristy heritage town that it is today. Back in the 1800s, it was the main market centre for the surrounding farmland. It was a factory town as well. People in Elora worked in the gristmill, or the knitting mill, or in factories churning out furniture, brushes, carpets and organs. The artistic transformation of Elora started in the 1970s, when developers began cleaning up the historic but distressed old buildings along Mill Street and creative townspeople began setting up boutiques and studios and putting on festivals and other cultural attractions such as theatre productions. If you want to learn more about the history of Elora Ontario, check out Historical Walking Tours of Elora. You can buy tickets at the Elora Welcome Centre at 5 Mill Street East. The most famous and most scenic spot to eat in town is the Elora Mill Inn. This is the place you'll see on all the postcards and tourist brochures.Try for a window seat near the water. The main street has a few dining options. If you’re looking for vegetarian meals, check out The Desert Rose (you can’t miss the rose-coloured building on Mill Street!). Apart from the Elora Inn, you’ll find about half-a-dozen Bed and Breakfasts located in heritage homes in town as well.